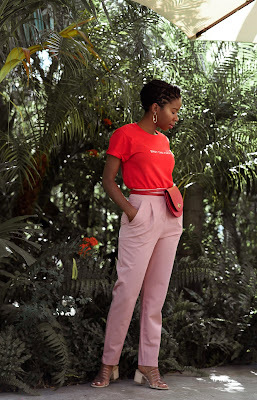 It's been a while since I've last posted an outfit on the blog so I wanted to share a trend that I've really been into lately: Monochrome colour-blocking, i.e colour-blocking with shades/hues of the same colour, por ejemplo: Pink & Red. On a regular day, I am minimalist at best so I love a simple look. 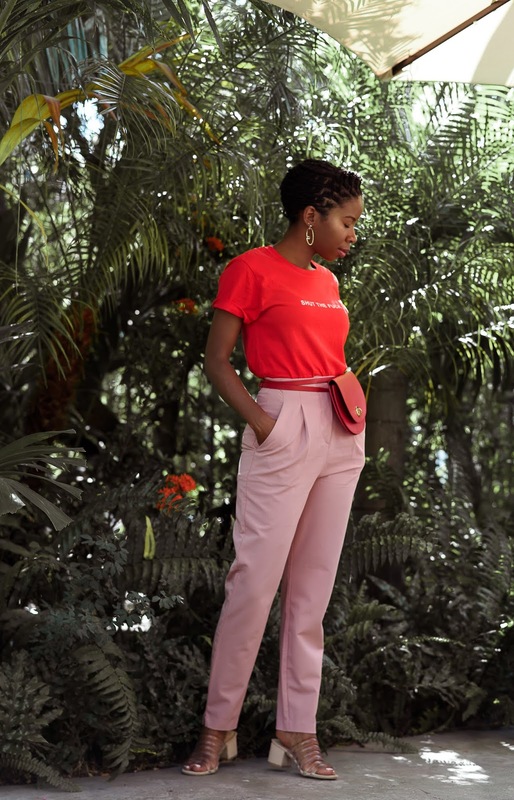 Monochrome colour-blocking is a fool proof way to always look stylish without the fuss, plus you won't have to worry too much about being "matchy-matchy" ....especially on those lazy days. 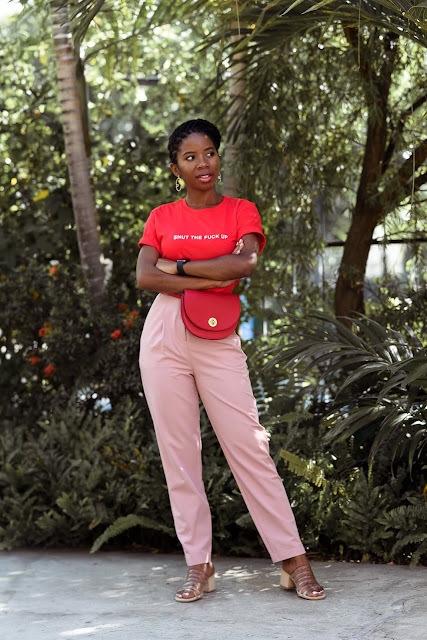 For this ensemble I paired a simple graphic tee with tailored high waisted pants (every vertically challenged girl's secret weapon to looking 10 ft tall). 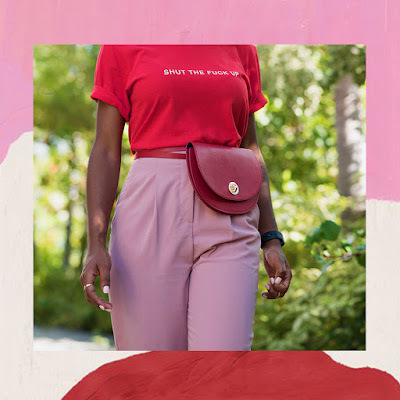 The "belt bag"is actually a crossbody bag I converted into bum -bag because, unless you've been completely out of touch, everyone and their granny is wearing a fanny pack right now. 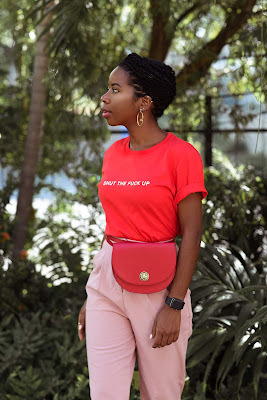 Since pink and red make such a bold complement, I decided to add some clear strappy sandals to the mix and the cutest little statement earrings to complete the look. 1. That inner voice that tries to talk me out of taking risks and pushing beyond my comfort zone. 2. 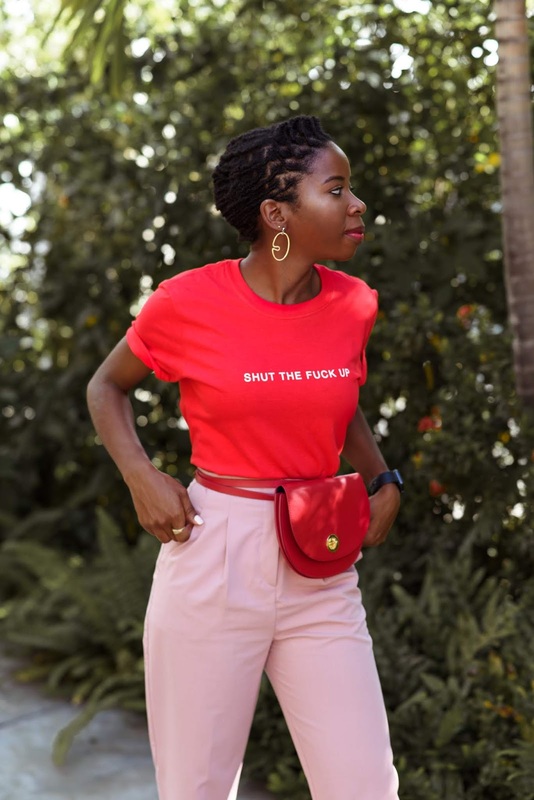 Badmind people who never have anything nice to say. 3. People who say stuff like "I don't read." 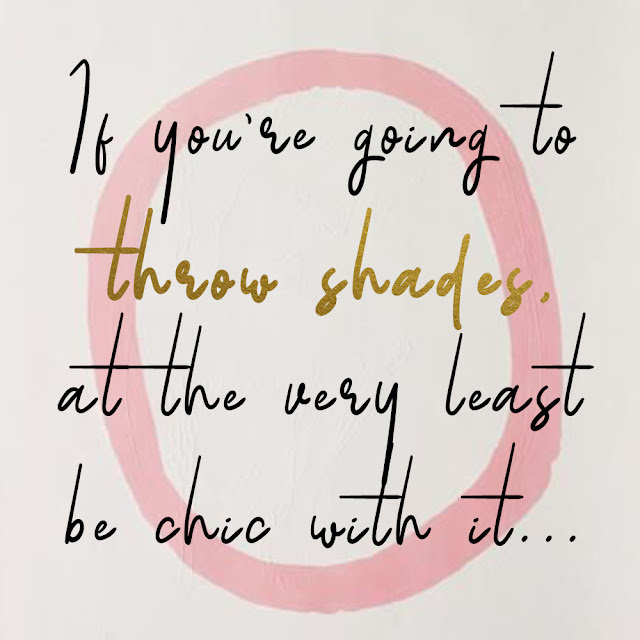 Oh and since its Breast Cancer Month, it's the perfect opportunity to take this trend out for a spin. Let's wear Pink to show our support for the badass women who have fought and are fighting as we continue to spread hope + awareness for the cause.